Barilla® Traditional Basil Pesto is imported from Italy from an authentic recipe that offers the home cook a fresh from the garden taste. Our Basil Pesto is an ideal complement to any of our pastas that the whole family will enjoy. Traditional Basil Pesto is made with non-GMO ingredients. For more information, please read our position. Barilla® Traditional Basil Pesto's light and clean flavor is delicious on all types of dishes including; pizza, sandwiches, fish, chicken and veggies. It's simple and delicious flavor also goes well with any of our delicious pasta shapes, like Farfalle or Linguine. Traditional Basil Pesto sauce is delicious tossed with just about any Barilla pasta. 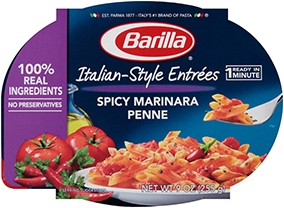 Try this classic sauce with the Barilla Spaghetti family or our Jumbo Shells or Lasagne for an easy-to-prepare, authentic Italian pasta meal.